﻿Yesterday was Chris' birthday, so of course I had to make him one of his favorite meals: shrimp scampi! He's a huge seafood lover, and in my opinion you can never go wrong with shrimp. Mix in a little lemon juice, wine and butter....then you've got yourself a little treat! I made this alongside some filet mignon and it was a perfect compliment. I was even able to time everything perfectly, which always makes the process less stressful. I seared the steak on the stove then popped it in the oven, and while it was in there I had the exact amount of time I needed to cook the scampi. Don't you love when dinner just all comes together so easily? Timing everything just right can definitely be a challenge, but when you get it on target it makes the meal even better! Learning to cook shrimp perfectly takes a little skill, but with some practice you will get the hang of it in no time! The key is to lay them all flat in the skillet in a single layer. As soon as you see a little pink coming through, flip them!! They'll only need another minute or so on the other side. If you overcook them they'll get chewy and rubbery, and that's no good. So remove them as soon as they get pink and you'll be set! Add pasta to large pot of boiling water. Cook 6-7 minutes or until al dente. In large non-stick skillet, heat 2 tbsp. butter and olive oil over medium heat. Add garlic, red pepper, parsley and basil; saute 3 minutes. Season shrimp with salt and pepper. Add to skillet in an even layer and cook for 1 minute or until you see pink begin to come through. Immediately flip and cook the other side for 1 minute. Remove shrimp from skillet and keep warm. Add lemon juice and wine to the same skillet. As mixture comes to a boil, add 2 tbsp. butter. Return shrimp to the skillet. Drain pasta and add that to the skillet as well. Stir to combine and serve. YUM!! 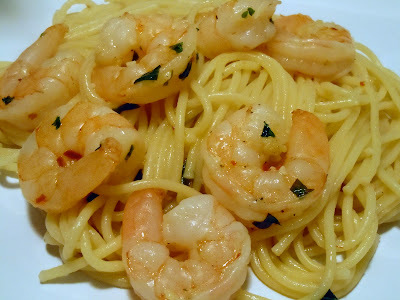 You have to love a good Shrimp Scampi :) It looks wonderful. Tempted me to make Scampi this weekend. Thanks.